White Sands is one of those places that you have to see to believe. 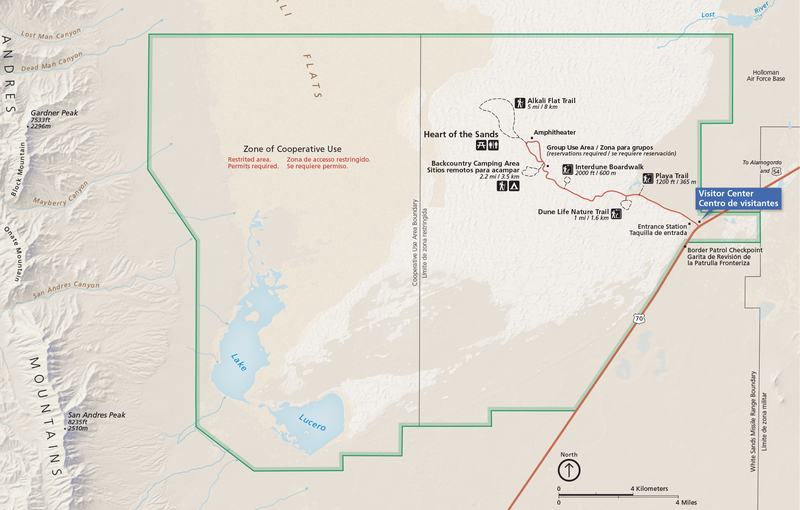 A sort of geological alchemy shaped by the constant interplay of wind and water over thousands of years, it’s the largest gypsum dune filed in the world spanning 275 square miles. Visitors can explore a seemingly endless sea of sparking white sand that is completely pure and fine (like the sand in an hourglass) and not dusty or gritty like regular sand. And what makes it even more interesting is that the sand is not actually white, rather it began as clear crystals that became smaller and scratched as a result of weathering over time. It truly is like no other place on Earth. 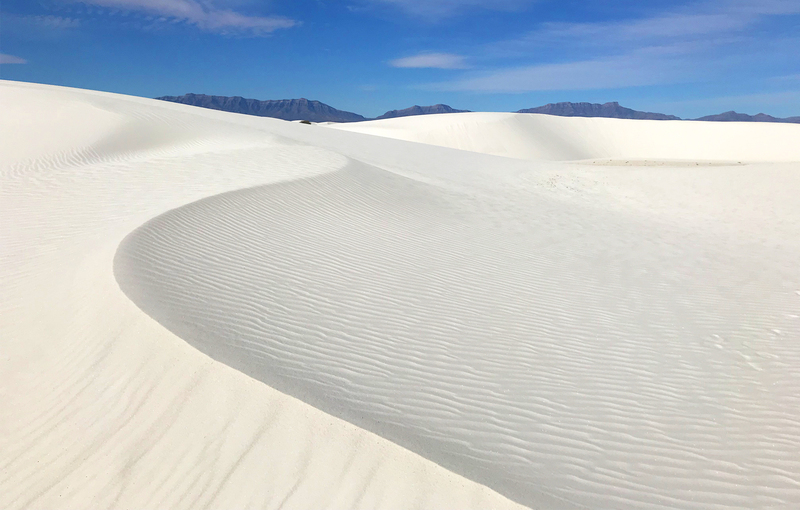 Located in southern New Mexico near Alamogordo (3.5 hours south of Albuquerque and 1.5 hours north of El Paso), White Sands was first established as a National Monument in 1933. Today you’ll find 5 established trails that vary in length and difficulty with options for all ages and abilities (we tend to take a more adventurous approach but even my toddler was able to keep up and had the best time). There’s also a ton of other parking and picnic areas that you can explore from along Dunes Drive, which extends from the entrance to the heart of the dunes. The best time to visit is the spring or the fall as temperatures can reach extremes during the hot summer months and the White Sands website is a great place to find maps, a calendar of activities and other basic information like safety tips and what to bring. The Visitor Center is also excellent, including the gift shop where you can purchase plastic saucers for sledding on the dunes. 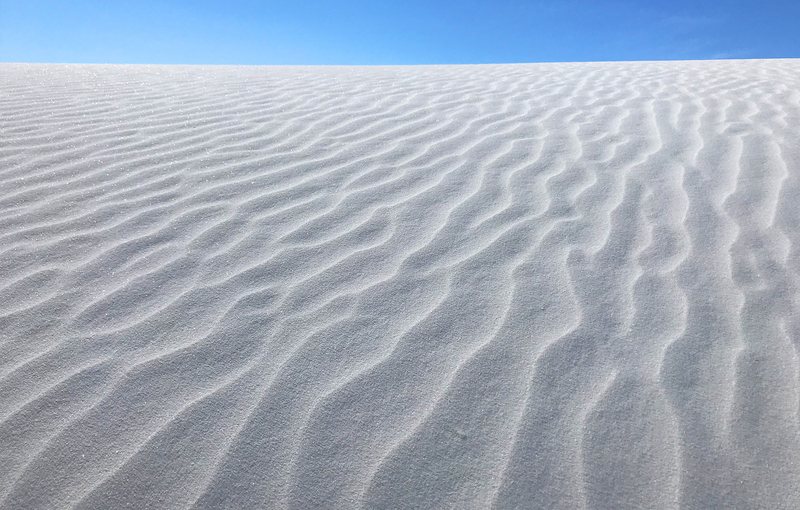 We went to White Sands for a quick weekend away in March and our experience was nothing short of incredible. The first night we drove about 15 minutes down Dunes Drive and parked our car in one of the roadside lots. From here we walked across a couple of dunes before finding a spot where we could enjoy our picnic dinner and a striking sunset that washed over the dunes with its pink hue. The next day we ventured further out to the Alkali Flat Trail (which is not at all flat) and into an otherworldly landscape that was relatively untouched. Here are just a few photos from our trip to White Sands, which don’t do justice to how surreal this place actually is. Yes, it’s pure magic. We stayed in Alamogordo at the Fairfield Inn & Suites on Panorama Boulevard about 15 minutes from the White Sands Visitor Center, which was recently remodeled and offered free breakfast in the morning so we were able to get up and out quickly. In terms of other places to eat, we didn’t dine in town but did pick up amazing sandwiches to go at the Brown Bag Deli on Washington Avenue, which was perfect for a picnic dinner on the dunes. There are also a handful of grocery stores nearby to pick up other snacks and beverages. On the way out of town we treated ourselves to Caliche’s Frozen Custard on North White Sands Boulevard, which came highly recommended but without warning of the gigantic proportions of the “regular” size sundaes. 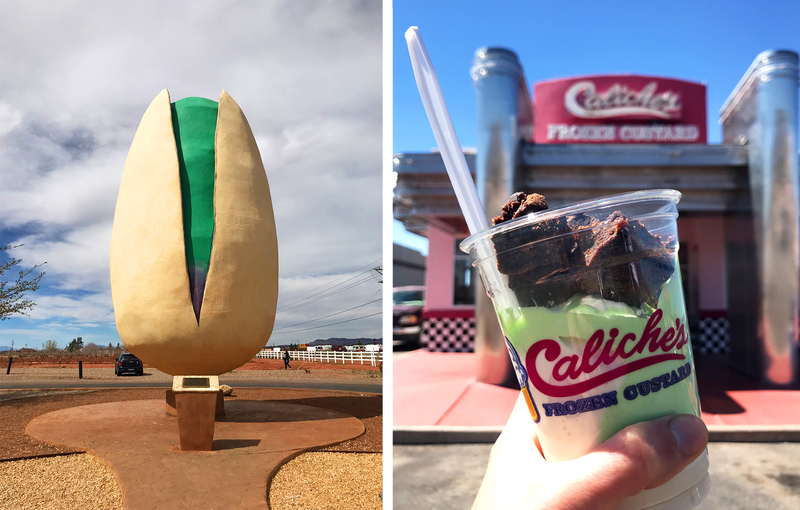 Another great place to stop just outside of Alamogordo is McGinn’s PistachioLand, home of the “World’s Largest Pistachio”. You’ll find a great old fashioned country store with tons of local products (the prickly pear chocolate bar was delicious), as well as farm tours, free pistachio and wine tastings and an adjoining ice cream parlor. I looks amazing! The white sand with the blue skies make an incredible contrast!